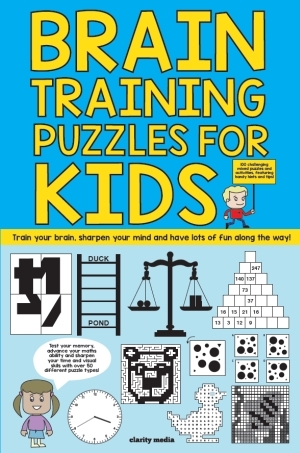 Welcome to this fun and exciting collection of 100 brain training puzzles for kids! This book is packed with content that will test your memory, sharpen your maths ability and advance your time and visual skills. As well as plenty of illustrated puzzles, there are great classics such as sudoku, wordsearch and crosswords that are sure to keep you entertained for hours. Our book is filled with an appealing mix of fun and educational puzzles meaning children will enjoy learning whilst having plenty of fun! - Rotation & Reflection: can you spot the correct answer once shaped have been rotated and reflected? - Money Exercise: getting to grips with money - can you complete the shopping exercise and work out how much money is left? - Dot To Dot: connect the dots and then colour in! 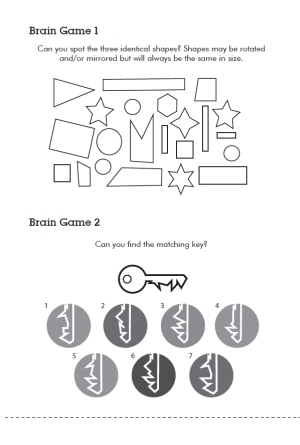 All puzzles come complete with solutions, and handy tips and hints are given throughout. Can you take on the challenge and solve all 100? Good luck!